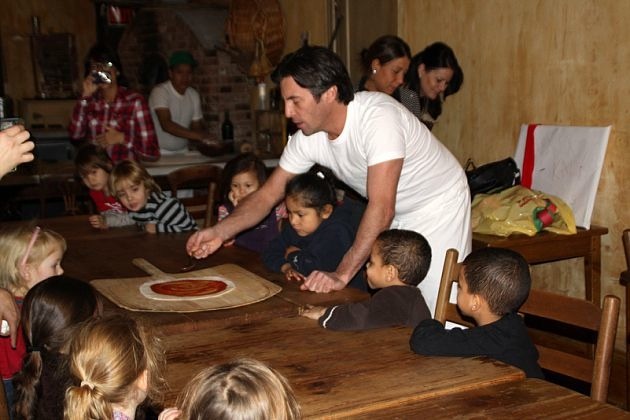 Mark Iacono, Lucali chef/owner, shows preschoolers how to make world-famous pizza pie. Iacono was stabbed Friday on Smith Street at Carroll Street. Full disclosure: Mark Iacono, the famous and well-loved pizza chef/owner of Lucali, on Henry Street near Summit Street, is a friend. He’s a loving father of a little girl. He has a calm, sweet spirit, he is generous and kind. It’s nearly impossible to imagine him as an aggressor in a street fight. So all this news of trouble he may be in, following the stabbing on Smith Street at Carroll on Friday afternoon, between Iacono and a man with a long and lengthy criminal history — it’s a gold mine to many a city reporter, but just worrisome to us here at South Brooklyn Post. We wish the best to Iacono and his family. The city columnist Mike Daly, at The New York Daily News, had the best article that we’ve found on the incident, getting behind the drama and talking to folks in Carroll Gardens to shed light on this situation. If you’d like to read more about the stabbing, which landed Iacono in the hospital, and now has resulted in attempted murder charges for both men involved, and for which police and prosecutors claim has to do with a mob-affiliate collecting money, you won’t have to look far. It’s a media frenzy. Update, Sunday, April 17: Mark Iacono, the chef/owner of famed Carroll Gardens pizzeria Lucali is doing OK after a stabbing Friday on Smith Street. April 15 — Local father and famous brick oven pizzeria owner Mark Iacono, 43, was stabbed multiple times in front of Joe’s Superette, on Smith at Carroll, in front of P.S. 58, at a little before 3 p.m. Friday. He was rushed to Lutheran Hospital and according to The New York Times he is in serious but stable condition. A suspect in the stabbing, 35, a white male, was taken into custody at Long Island College Hospital, where he went to receive treatment for lacerations to the face and hands, the police said. Iacono’s pizzeria, Lucali, on Henry near Summit, has been rated among the best in the city and country by many a food writer and by publications including Zagat’s, GQ and others. The tiny pizzeria draws visitors from around the world and is said to be frequented by celebrities such as Jay Z and Beyonce. The scene of the stabbing, which occurred in broad daylight on a well-trafficed street in prime Carroll Gardens was chaotic Friday. First the police swarmed and then the media. Iacono was arguing with his attacker before the perpetrator pulled a large knife and started stabbing him. check the latest news, this Mark Lacono is not clean and will be charged with… attempted murder!